In 1982, art exhibitor Thaddaeus Ropac visited a basement studio in New York. Accompanied by Andy Warhol, already a living legend, he might have imagined that he was in the presence of a man who would become America’s most expensive artist. But what he couldn’t have foreseen was that the title would ultimately belong to the young black man hunched on the floor drawing. At an auction at Sotherby’s last week Jean-Michel Basquiat surpassed Warhol and placed his name alongside that of Pablo Picasso and Francis Bacon among the world’s most prized painters. The introduction which followed set in motion nearly a decade’s worth of collaboration between Ropac and art’s so-called “wild child”. Basquiat emerged in the early 1980s at a time when the United States was hungry for painting. His style broke with the minimalist and conceptual conventions that had come to dominate American art over the previous decade, Ropac said. The self-taught artist of Puerto Rican and Haitian origin became a celebrated phenomenon in a very short amount of time. He wore designer clothes and people would stop him to ask for autographs. Basquiat was born in Brooklyn on December 22, 1960. From an early age he showed an affinity for drawing according to The Estate of Jean-Michel Basquiat, which chronicles the artist’s life. He would frequently be joined in his sketching by his mother Matilde whose influence in taking him to visit New York’s art museums helped cultivate Basquiat’s artistry. By the late 1970s Basquiat was earning a name for himself. He had joined classmate and graffiti artist Al Diaz to form the enigmatic collective SAMO. Together they tagged lower Manhattan buildings with cryptic messages which attracted media attention, according to the Barbican performing arts centre in London, which will exhibit more than 100 Basquiat works in September. By 1983 he exploded onto the world scene, painting in his own blood, on clothing, on architectural fragments and on enormous canvases. He also made appearances in film and television shows, the Barbican said. He soon was taken in by Andy Warhol with whom he collaborated and had a close relationship punctuated by mutual respect and trust. Basquiat was in awe of Warhol and the two were matched intellectually. It was a relationship on which Basquiat depended and struggled to recreate after Warhol’s death in 1987, Ropac said. In that basement studio in Soho, Warhol’s introduction was enough for Basquiat to give Ropac 12 of his drawings to take back to Austria for Ropac’s first gallery opening in 1983. The two would work together throughout the decade in gallery exhibits in 1985, 1986 and 1988. Basquiat’s early wave of recognition, however, brought with it the scrutiny of critics. By the late 1980s they were highly critical of his work. They said Basquiat was repeating himself. It is criticism some say may have contributed to his premature death in 1988 of a heroin overdose at the age of 27. 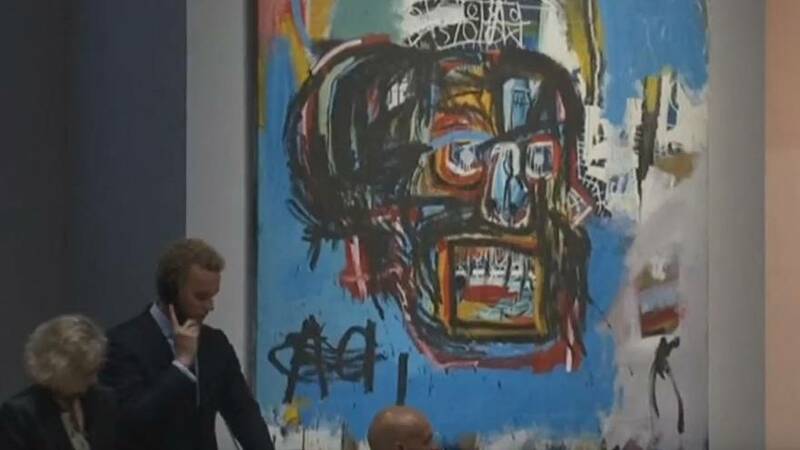 Fast forward 30 years and on Thursday, May 18, one of Basquiat’s paintings sold at auction for $110.5 million (€99 million) after a 10-minute bidding war. It was bought by Yusaku Maezawa, the founder of online retailer Start Today. His untitled 1982 depiction of a skull became the sixth most expensive artwork ever sold at auction. It is a record amount for any work by an American artist and is the highest-ever price at auction for an artwork created after 1980, said Sotheby’s. In 1984, when this painting was previously sold, it earned $19,000. In 1982, Basquiat was just 21 years old. The auction is proof, said Malat, of people’s vastly different attitude toward Basquiat today and is indicative of how highly coveted his work has become. Malat said in 2007 he sold a Basquiat painting for nearly €1.5 million. Six years later the painting was resold for roughly €8.5 million. Despite his work’s value, however, Basquiat is rarely exhibited as most of his works are in private collections. The Barbican’s exhibit, for instance, will be the first in the UK in more than 20 years and not one museum in the country has a Basquiat as part of their public exhibits, the Barbican said. Museums have to resort to waiting until one is either donated or loaned, or in the case of Basquiat’s record-breaking untitled piece, privately bought for a newly commissioned museum. Maezawa said in a statement he intends to have the Basquiat painting be the centrepiece of a future museum he is building in this hometown of Chiba, Japan.